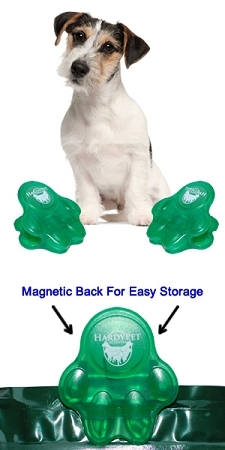 This HardyPet Magnetic Bag Clip is the perfect accessory for any dog owner. We utilize only high tensile compression springs to provide unsurpassed holding power which keeps your dog food fresher, longer. Another unique feature of our bag clip is the amazing magnetic button on the back of the clip. This feature gives you another option to store any unused clips by attaching the magnetic portion to a refrigerator or other flat metal surface. Many of our customers use our clips to hold important papers and reminder notes while attached to their refrigerator. Made from BPA-free plastic and other high grade materials, the HardyPet Magnetic Bag Clip will provide valuable service to your family for many years.